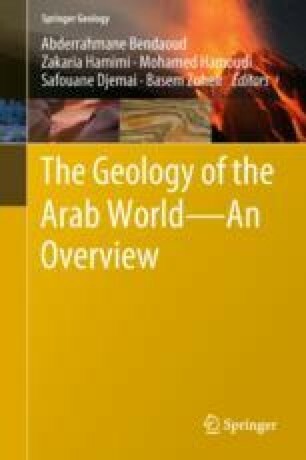 This chapter provides an up-to-date review about confirmed, proposed, and disproven meteorite impact structures in the Arab countries. Among the ~190 confirmed impact structures/sites on Earth, only 13 have been identified in the countries of the Arab world: Agoudal (Morocco), Amguid (Algeria), Aouelloul (Mauritania), BP (Libya), Kamil (Egypt), Oasis (Libya), Ouarkziz (Algeria), Jebel Waqf as Suwwan (Jordan), Saqqar (Saudi Arabia), Talemzane (Algeria), Tenoumer (Mauritania), Tin Bider (Algeria), and Wabar (Saudi Arabia). Thirty-three other structures of alleged impact origin and located in the Arab countries have been proposed in the literature. Based on the examination of satellite images and available field geologic, petrographic, and geochemical documentation, some of these proposed features are not of impact origin. Others are promising impact crater candidates. The record of impact structures in the Arab region is still incomplete considering the great size of the territory and the number of impact craters known in other regions where there have been active programs to study impact structures. Field investigations, including the collection and analyses of rock samples, are required for adding new candidates to the list of confirmed impact craters in the Arab countries. The only criteria that prove evidence for an impact origin of circular geological structures are the occurrence of shock-metamorphic effects in the target rocks (shatter cones and diagnostic shock-metamorphic mineral deformation and transformation phenomena), the discovery of preserved meteorite fragments, or detection of geochemical traces of meteoritic projectiles. Particular attention should be paid during fieldwork and subsequent petrographic studies, as some structures previously identified as impact craters had to be discounted. Nine of these cases of discredited structures are described here. I thank Martin Schmieder for comments and suggestions on the first version of this manuscript. I appreciate the detailed and helpful comments and reviews by Wolf Uwe Reimold that strongly improved the final version of the manuscript. Abderrahmane Bendaoud is thanked for editorial handling of this chapter. I am grateful to Zakaria Hamimi for providing copies of papers of the Annals of the Geological Survey of Egypt. This paper is a contribution to the Africa Initiative for Planetary and Spaces Sciences (AFIPS). Most of the images of the structures presented in this paper were processed in principal component analysis (PCA) from Sentinel 2A images for better visibility of these structures. Sentinel-2 is ESA’s medium spatial resolution super-spectral instrument with a large field of view (290 km), a high revisit capability (5 days with two satellites), a high resolution (10, 20 and 60 m), and a moderately large band set (13 spectral bands) aimed at ensuring data continuity, following the Landsat and SPOT ages, for global land surface monitoring (van der Meer et al. 2014). The Sentinel-2A satellite was successfully launched on 23 June 2015. The Sentinel-2A MSI images were downloaded from the Sentinel’s Scientific Data Hub (https://scihub.copernicus.eu/). PCA processing was applied to the four bands at 10 m resolution (B2, B3, B4, and B8, corresponding to the blue, green, red, and near infrared spectral segments). The Landsat 8 OLI satellite image of the In Ezzane structures (Fig. 9) was downloaded from the website http://earthexplorer.usgs.gov/.